NEW YORK, NY--(Marketwired - Jan 23, 2014) - Canvasback Music/Atlantic recording artists Grouplove have announced the digital release of "I'M WITH YOU" a short form documentary and concert film featuring the LA-based indie-pop band. "I'm With You" will be available at iTunes and Amazon on February 25th. Shot by acclaimed filmmaker Sam Erickson -- known for his work with Dave Matthews Band and "Okonokos," the groundbreaking concert film featuring My Morning Jacket -- "I'M WITH YOU" is a compelling exploration into Grouplove's history and traces their unique story, combining engaging interviews with the band members and exhilarating live performance footage. The digital video bundle will include six exclusive audio tracks recorded during the band's sold-out "SeeSaw Tour" -- which featured two-night stands in eleven cities across the country with the band performing electric and acoustic shows -- this past fall (see attached track listing). To echo the unique format of the tour, the track list is highlighted by recordings from both The Bowery Ballroom (electric) and McKittrick Hotel (acoustic) during the band's New York City stop. Captured during the filming of the documentary, a live video for one of featured tracks -- "I'm With You" -- made its exclusive premiere on SPIN.com and can be viewed now at http://youtu.be/MtuCZGFxvlA. "I'M WITH YOU" will make its television broadcast premiere on Palladia at 9pm ET on January 24th with additional airings to follow (check local listings). A trailer for "I'M WITH YOU" can be viewed now at http://youtu.be/TvC-IGnyIvg. As previously announced, Grouplove's headlining North American tour is set to kick off on March 20th at Bogart's in Cincinnati, Ohio and continue into May (see attached itinerary). Due to overwhelming demand, the band recently added a second night at Stubb's in Austin, TX, and a third show at 9:30 Club in Washington, DC. Additionally, the cross-country trek now includes a performance at this year's Coachella Valley Music and Arts Festival -- the band's second appearance at the acclaimed festival -- as well as Big Guava Festival in Tampa, FL and Firefly Festival in Dover, DE. For more information, please visit www.grouplovemusic.com/tour. LA-based band Grouplove has quickly become one of music's most exhilarating young acts. The quintet's second full length album "SPREADING RUMOURS" arrived in September and was met with a raft of acclaim from the likes of Rolling Stone, USA Today, Entertainment Weekly, Los Angeles Times, NYLON, and National Public Radio who called it "ludicrously easy to love." As with all of Grouplove's recorded material, the collection was produced by the band's own Ryan Rabin and features singles "Ways To Go" and "Shark Attack." Grouplove launched "SPREADING RUMOURS" with the sold out "SeeSaw Tour," which featured two-night stands in eleven cities across the country, treating fans to an electric show the first night and a stripped down/acoustic set the second with all performances taking place in intimate settings, including legendary clubs, historic sites, and obscure or rarely used venues. In October, Grouplove made their inaugural appearance at the Austin City Limits Music Festival. Grouplove first came together in 2009 and soon were hailed as a great live act, both as headliners and at such international festivals as Coachella, Bonnaroo, Lollapalooza, Outside Lands, Reading + Leeds Festivals, and Glastonbury. "NEVER TRUST A HAPPY SONG" arrived in 2011, making a stellar chart debut among the top 5 on Billboard's "Heatseekers" album chart for new and developing acts. The acclaimed album was highlighted by the debut single, "Colours" which received critical acclaim and climbed to the top reaches at Alternative radio outlets nationwide. "Tongue Tied," the second single from "NEVER TRUST A HAPPY SONG," proved an even greater success, earning RIAA platinum certification for sales in excess of 1 million while spending 3 consecutive weeks at #1 on the Alternative airplay chart. By year's end, the track became Alternative radio's second most-played song of 2012, following only Gotye's "Somebody That I Used To Know." The third single, "Itchin' On A Photograph" also reached the Top 10 at Alternative radio. Grouplove's dynamic live sets continued to win over fans on a pair of headline tours, both of which saw sold out crowds at every stop, including a hometown finale at the Wiltern Theater in Los Angeles. That same undeniable energy was seen in an array of high profile television appearances, including CBS' Late Show with David Letterman, NBC's TODAY and Tonight Show with Jay Leno, TBS' Conan, and ABC's Jimmy Kimmel Live! 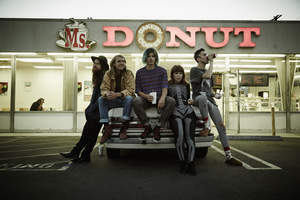 Grouplove is: Christian Zucconi (vocals, guitar), Hannah Hooper (vocals, keys), Sean Gadd (bass, vocals), Andrew Wessen (guitar, vocals), Ryan Rabin (drums).